Prime Minister Gordon Brown has set targets to increase the number of pupils in secondary school in England taking science subjects. In the next five years, Mr Brown wants to double the number of pupils taking "triple science", which includes biology, chemistry and physics. He also wants to have access to science as single subjects in 90% of schools. 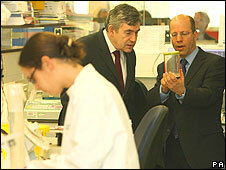 Mr Brown, speaking at Oxford University, says he wants to "ring-fence" science during the recession. The prime minister emphasised the economic importance of protecting the investment in science. "Some say that now is not the time to invest, but the bottom line is that the downturn is no time to slow down our investment in science. We will not allow science to become a victim of the recession," said Mr Brown. There were also promises to offer "personalised support from education consultants" for graduates made redundant from science and technology companies who are considering re-training as maths or science teachers. Mr Brown set out targets to increase the number of pupils taking the triple science option, at present taken by 8.5% of students. By 2014, he said he wanted to double this figure, representing an extra 100,000 pupils. There was also a target to increase the number of pupils taking A-level maths, from 56,000 to 80,000 in the next five years. The Conservatives' Schools Secretary, Michael Gove, rejected the promises. "The government's latest promises are completely meaningless given Labour's appalling record on science. "The reality is that thanks to their reforms the number of children taking only one science GCSE has doubled in the last year alone, and there are whole areas of the country where not a single child sits three sciences at GCSE." Mike Harris of the Institute of Directors said there was an important economic need to provide specialist science and maths teachers in schools to help nurture the subject and to protect the supply of graduates in these fields. "The uncomfortable reality is that despite reservoirs of good will, considerable industry engagement and positive government intervention, the number of graduates in the key Stem [science, technology, engineering and maths] disciplines has at best remained pretty flat in recent years. This must be turned around, and quickly." 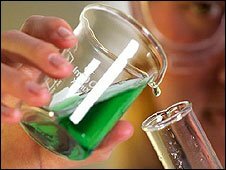 There have been warnings about the difficulty in recruiting specialist science teachers. Last summer, a report from the University of Buckingham found that almost one in four secondary schools in England no longer has any specialist physics teachers. On the wider issues associated with the "knowledge economy", Mr Brown stressed that he would maintain the increased momentum in expenditure he outlined as Chancellor in the 2004, in his 10-year Science and Innovation Investment Framework. This should see public spend in the science base of the UK rise to £6.3bn by 2010/2011.